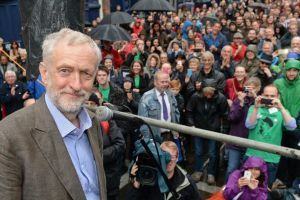 Making Jeremy Corbyn the Prime Minister of the U.K. would do more for the world and everyone in it than either of the two available outcomes of any recent U.S. election could have done. Here in the U.S. I always protest that I am not against elections, I think we should have one some day. Well, now we have one — only it’s across the pond. Corbyn’s record is no secret, and you don’t need me to tell you, but I have met him and spoken at events with him, and can assure you he’s legitimate. He’s been a dedicated leader of the peace movement right through his career. He had the decency last week to point out yet again that invading and bombing countries and overthrowing governments produces terrorism; it doesn’t somehow reduce it or eliminate it or “fight” it. Britain is the key co-conspirator in U.S. wars. One real-life Love Actually refusal to bow before Emperor Donald, and the facade of super-hero law enforcement will begin to crumble, revealing a rogue serial killer standing naked in his golden hotel suite. The world needs an actual popular elected response to U.S. aggression against the world’s poor and the earth’s climate. A ho-hum housebroken Frenchman who’s not a fascist isn’t the same thing. Corbyn supports successful Scandinavian socialism, demilitarization, environmental action, and aid to those in need. He works within the government and is held back by his party. But he doesn’t lie. He doesn’t sell out. He makes the case for wise and popular policies as powerfully as he’s able. Want people to believe representative government is compatible with capitalism? Want well-behaved voters the world over to imagine that the corporate media can actually be overcome? Stop grasping at Congressional candidate gun-nuts who happen to be Democrats. Stop telling vicious lies about Russia in an attempt to travel back in time and cause a corporate militarist hack to win the White House. We actually have an election between an actually good candidate and one of the usual monstrosities we’ve become so used to. Contact every young person you can who can vote in this election. Contact every possible organization and entertainer who might help spread the word. Get every Hollywood star who ever tried to rock the vote but didn’t have anyone to promote who people actually wanted to vote for to notice this golden opportunity. Telling young Brits to get out and vote for Jeremy will do more to spread democracy than destroying Syria, starving a million children in Yemen, or occupying Afghanistan for another 50 years. Young people, sadly, have seen through our scams. They’ve heard us cry wolf too many times. Yet if you ask them who they would have voted for, they tell you the better candidate. Now here’s an actually great candidate, and their televisions are telling them that they are powerless to do anything. And they refuse to see through that scam. You have to help them see through it! You have to find somebody hip enough to help them! Young British people are our last hope, and it’s your job to encourage them. We could have a world in which a leading wealthy “democracy” has a government that responds to majority opinion. We could have a world in which London says to Washington: “You want another war, we won’t help you pretend it’s legal. In fact, we’re drafting a brief for the prosecution and will see you in court.” The people of the United States need that fig leaf torn away, need the pretense that mass murder is legal and necessary ended in our own minds. The peace, prosperity, sustainability, and friendship awaiting us is too much for us to even imagine. What might help us do it, what might make us believe that “hope” and “change” and other concepts we’ve almost come to despise could actually be possible would be making Jeremy Corbyn Prime Minister. Corbynize This Trumped Up World.